Plot synopsis: A spaceship lands on a planet where a previous ship from Earth had crashed twenty years before, and when the crew of the former encounters the sole survivor of the latter, they learn that he has discovered what appears to be a race of extraterrestrial humans. Based on a short story first published in Galaxy Science Fiction magazine, in July 1953; and later in James H. Schmitz's short-story collection Eternal Frontier, in 2002.
Review: There's a fair idea at the heart of this episode, but it's let down by a number of weaknesses. 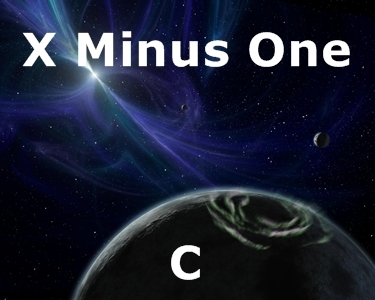 One is simply that, as with many X Minus One episodes featuring characters on a spaceship, the sound effects used give the impression that they are aboard a submarine, rather than a space vessel. This is not a little distracting. More serious, though, and what really hamstrings the story, is that it is extremely obvious, almost as soon as the spaceship's crew arrives on the alien planet, what the secret of its 'human' inhabitants is. Perhaps when the episode was first broadcast it may have been less so, but anyone even passingly familiar with television science fiction of subsequent decades will be able to guess the 'surprise' reveal - The Twilight Zone, Star Trek and The Outer Limits, to name just three, have all featured stories with similar ones. The other major problem with the episode is that the human characters come across as a pretty trigger happy bunch, with no one questioning the idea that the only way to deal with the 'ugly' worm-like aliens on the planet is to slaughter them. Indeed, the humans all seem quite bigoted, interested in finding intelligent life elsewhere in the universe only if it is human-looking. So, there is a definite undercurrent of prejudice to the story. The one genuinely interesting element of the plot is the marriage between the Earthman who has been on the planet twenty years and one of the female natives, though disappointingly, the implications of this inter-species union - not least the physical ones - are not explored. Plot synopsis: The native inhabitants of a Pacific island place a curse on the American military unit that is trying to remove them so that the army can use the island as a test site for a new bomb. Review: This episode plays out against the background of the extensive nuclear testing that took place in the South Sea islands in the 1950s (which were eventually banned due to the controversy surrounding them). At the start, it appears as if this is going to be a straightforward heartless-military-versus-noble-savages story (like an Earth-set Avatar), but the episode wrong-foots the listener in the second half by developing in a very different direction. Explaining any more would give away too much, but suffice to say that, after a couple of inventive twists, the story builds to a satisfying conclusion. There's nothing really mind-blowing here, but this is a good episode nonetheless. Plot synopsis: In a future in which robots have replaced humans in most occupations, people have to invent new categories of jobs so as not to be classified as unemployed. Based on a short story, 'The Category Inventors', first published in Galaxy Science Fiction magazine, in February 1956.
Review: The main character in this episode loses his job as a musician because it has been taken by a robot, setting the scene for a story about the downsides of technology and progress. The episode is indeed quite Luddite in its perspective, which is made explicit when the protagonist attempts to establish a 'neo-Luddite' political party. Whatever one feels about this point of view, the conceit of people having to make up their own job descriptions is a fun one, even if the plot makes little sense. The ending - SPOILER ALERT! - only works if we believe that the office responsible for registering new job categories is so inept that it can be fooled simply by making up a gibberish-sounding job title. Even so, an entertaining story. Plot synopsis: A news reporter covers the story of an astronaut stranded in space. Based on a short story first published in Galaxy Science Fiction magazine, in February 1955; and later in James E. Gunn's short-story collection Station in Space, in 1958.
Review: The form, more than the content, is what is probably most interesting about this episode - that is, the way the story is presented as unfolding news coverage, which gives it a more naturalistic feel than most X Minus One episodes, almost a documentary-like one. Indeed, having the story told from the point of view of a news reporter - rather than that of the astronaut at the tale's centre, or the military and scientists attempting to rescue him - help make it stand out more than it otherwise would. This does, at any rate, make the adaptation significantly different to the original short story upon which it is based, which is told from the viewpoint of one of the astronaut's friends - although a definite weakness of this radio version is that the narrator delivers his lines in a rather flat, emotionless tone. As for the plot, for most of the episode's running time, it is largely a familiar one, following a similar pattern to stories of miners trapped underground, or children stuck down wells, and the frantic efforts to rescue them. However, there is a clever, and surprising, twist ending, which forces listeners to re-evaluate everything they have just heard. Plot synopsis: A small band of humans aboard a spaceship that has been captured by enemy aliens must work out a way to retake the vessel. Based on a short story first published in Galaxy Science Fiction magazine, in October 1951; and later, as 'C-Chute', in Isaac Asimov's short-story collection Nightfall and Other Stories, in 1969.
Review: In an introduction to the short story upon which this episode was based (in his collection Nightfall and Other Stories), its author, Isaac Asimov, writes that when he heard the X Minus One adaptation, the actor playing one of the main characters, Mullen, sounded exactly as he imagined he would sound. This is a notable, and rare, endorsement by a writer adapted for the series, but shows that X Minus One had at least some recognition from the wider science-fiction community - indeed, from one of its all-time greatest writers. This point of historical interest aside, the episode itself is a very good one. As with many of the best stories about aliens (or other 'monsters', like zombies), this one is more about the human characters, their relationships and interactions, than the non-humans. Thus, the scenes where the characters bicker, and reveal their weaknesses and prejudices, are the strongest. Also of note is that the tale is far from a simplistic, jingoistic one, in that we soon learn that the war being fought between humans and aliens is a senseless affair, in which neither side has anything of value to gain (since neither is capable of living on the same worlds as the other). Another significant theme concerns forming overly hasty preconceptions about others, as the story serves as a warning against judging people purely on first impressions; even if this message could have been delivered with a little more subtlety. Finally, looked at simply as an adventure story, the episode is also good fun, presenting an ingenious solution to the problem it sets up, involving clever use of the c-chute ('casualty chute') of the title. Plot synopsis: An intelligent, talking mouse at a secret atomic laboratory takes his request to have the mousetrap outside his family's door removed up the human chain of command. Based on a short story first published in Galaxy Science Fiction magazine, in May 1954.
Review: Talking mice are funny. From Stuart Little to The Hitchhiker's Guide to the Galaxy, the world of fiction provides numerous examples to show that there is something intrinsically amusing about imagining these small furry rodents having the ability to speak. So it is with this episode, in which a group of talking mice takes centre-stage. If the story had been written today, their existence would probably be the result of experiments in genetic engineering, but since this is the 1950s, radiation is to blame (as it was for all manner of weird and wonderful mutations in the science fiction of the era, in particular causing an alarming number of animals, like ants and spiders, to grow to outlandish size.) The plot itself is good fun, being quirky and offbeat, as it tells the tale of what happens when a super-evolved mouse takes his case for the removal of a trap that threatens his family all the way to Washington, and the far-reaching consequences that eventually result. What most raises the episode above average are its satirical elements, especially when it pokes fun at some of the absurdities of Cold War paranoia. For example, when one of the military men asks suspiciously 'Are these American mice? ', to inquire into the rodents' loyalties, this is a neat swipe at the superpower anxieties of the period. The episode is also nicely played by the cast, who ably deliver the script's witty dialogue. While quite a few of X Minus One's supposedly humorous episodes don't really stand up today, this one definitely does. Plot synopsis: A timid lawyer receives a mysterious package, which turns out to be a kit from two hundred years in the future that allows him to build living creatures, including human beings. Based on a short story first published in Astounding Science Fiction magazine, in March 1947; and later in William Tenn's short-story collection Galaxy of Ghouls, in 1955.